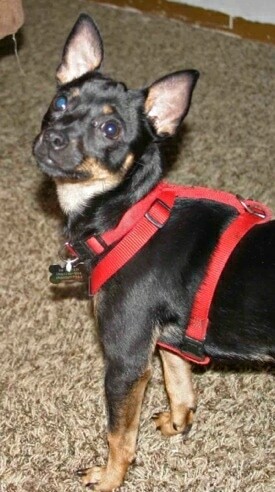 Bennie the Chipin at 10 months old—"Bennie is very loving and smart. He loves to cuddle, sleeps under the covers, and has bounds of energy." The Chipin is not a purebred dog. 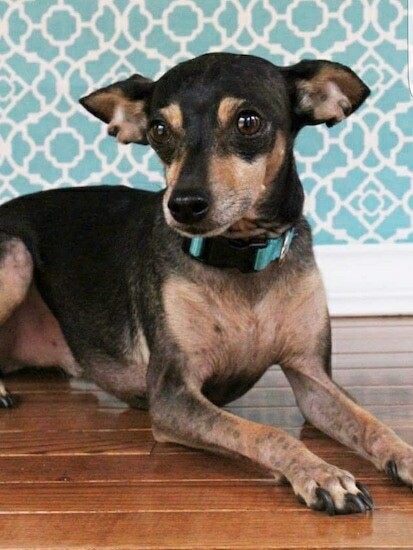 It is a cross between the Chihuahua and the Min Pin. The best way to determine the temperament of a mixed breed is to look up all breeds in the cross and know you can get any combination of any of the characteristics found in either breed. Not all of these designer hybrid dogs being bred are 50% purebred to 50% purebred. It is very common for breeders to breed multi-generation crosses. 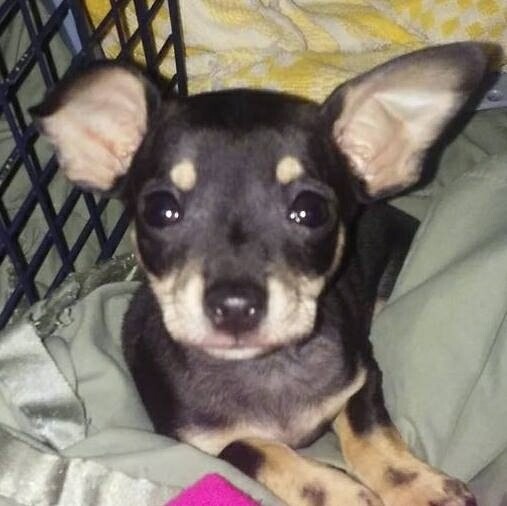 Bruiser the Chipin as a puppy at 10 weeks old—"I had recently lost my 12 year old Chihuahua and I searched for 4 weeks, but I couldn't find a puppy. Until I found this little guy on an eBay guide. Boy, what a breath of life he has brought into our world. Full of energy and very loving." 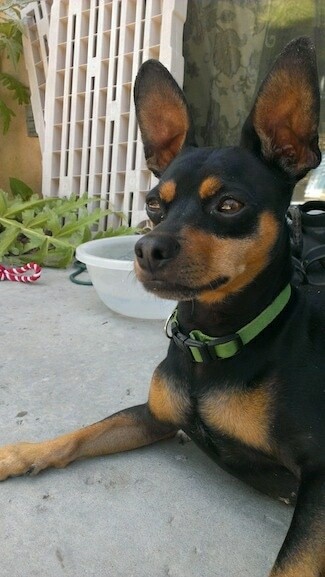 Lucky the Chihuahua / Miniature Pinscher mix breed dog (Chipin) at 18 months old—"Lucky is my Chipin. He is very smart and very headstrong. When he was born, there were three puppies in the litter. We were going to get rid of two of them, one male and the female, which we did get rid of. I was only going to keep Rocky, Lucky's brother, but I ended up so attached to both of them that I couldn't let either one of them go. So that's how Lucky got his name, he was Lucky I kept him. I am very happy I kept both of them because Rocky ended up getting parvo and died when he was almost a year old. Lucky got it also, but with a lot of work and perseverance he survived. I love him to death and he is very spoiled. He is full of energy and thinks he can take on the world. I have 3 other dogs, a Boxer, a Lab, and a Min Pin and they all get along great. Lucky even gets along with my Macaw, Coco. He is very protective of his family and let's strangers know it. He has turned out to be a great addition to our family." 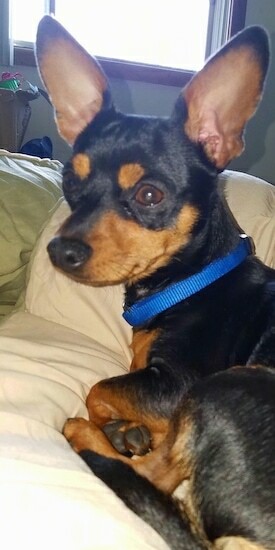 Roscoe the Chihuahua / Miniature Pinscher mix (Chipin) at 2 years old—"My Chi-Pin Roscoe was a gift that was found on Craig's list. My husband paid $150 for him and at 12 weeks old brought him home to me. 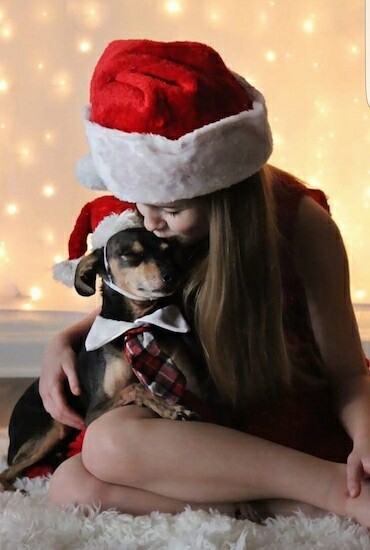 Not only was he adorable but he instantly took to me, he slept with me, we went on walks, car rides, there wasn't anything I did that didn't include my boy Roscoe. Now at almost 2 years old its the same, he is very sweet and loving and very smart! Potting training, sit, stay, and come he learned very quickly! He is wonderful and is my constant companion and I love him!" 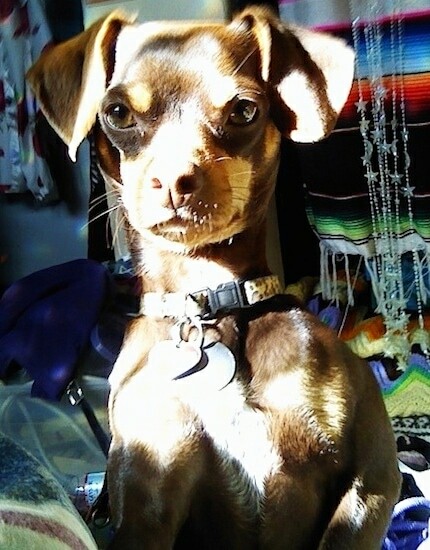 Toby the Chi-Pin at 2 years old—"Toby is the best bank withdrawal I ever made. While doing some banking I saw a pup come in behind me. I noticed how cute, thinking I might be able to pet him on the way out. I hear behind me the fateful words " he is looking for a new home " LOL I took him home that day. He was meant to be mine." Buddy the Chi-Pin at 4 years old—"Here is our 15 pound Chi-Pin "Buddy". Very fast, clocked him on my road bike at a 26mph sprint. He's a shelter dog and since then we've done mostly Cesar Millan's training with him and he's become quite the little character. He loves to run with big fast dogs and has no problem telling them when they get out of line. When he's not running he's sun bathing all day. Couldn't be happier with such an awesome dog. Will be looking for this hybrid in the future!" "Here are some pictures of my wonderful little Chipin Duke at about year old. I didn't know there was an actual name for his hybrid until recently, nor did I know they were so popular. Duke is almost 17 pounds of pure muscle, is very strong and just turned one about when this picture was taken. He's a ball full of energy, he's very playful, loyal, loving and definitely full of character!! 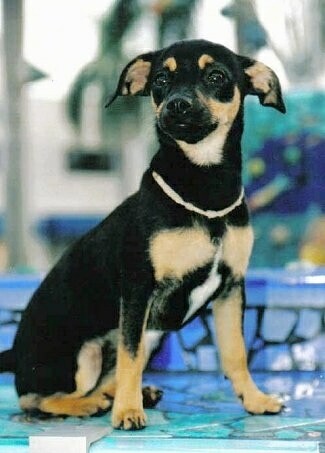 His dad was a very large Min Pin and his mom was a good sized Chihuahua. He loves playing with my husband and his favorite thing to do is go for walks and car rides with me. He is very well tempered and well loved. He definitely needs exercise and appreciates it when he gets it! He is very intelligent and loves to learn, his only naughty habits are jumping and barking. But he's getting better and is definitely a puppy! His sister Daisy (yep, Daisy Duke lol) from the same litter lives next door to me with my best friend and they LOVE to play with each other. Daisy is a few pounds lighter with a curly tail and pointier face and head; she is pure beige (same color as his lightest coloring)." "I took this picture in the house. 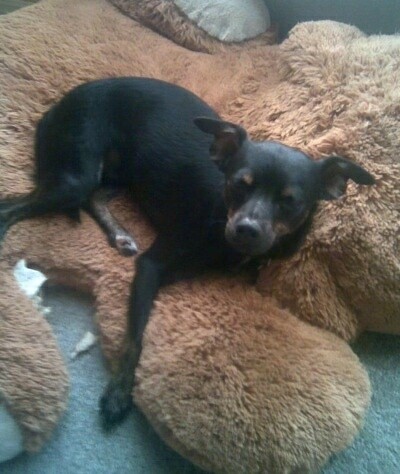 He was relaxing on his giant stuffed bear. His name is Sam and he is a 2½-year-old Chipin. I got him from the shelter. When I first brought him home he was terrified of everything and everyone because he had been beaten by his previous owner. He also had some dominance aggression with other dogs, was not housebroken, and didn't know a single obedience command. After trying out some of Cesar Millan's techniques mixed in with some techniques from other shows and books, but mostly Cesar Millan's, he has now lost all his fears and knows about 50 voice commands and has been housebroken. Cesar's techniques really saved Sam from a life of fear and possible aggression stemming from that fear. Sam is now learning agility which he enjoys immensely and would not have been able to do before because when performing agility, the dog is off leash and with tons of other dogs around. Sam would not have been able to be controlled and therefore, would not have taken even a fraction of the amount of joy he now takes from life. Thank you DogBreedInfo for recommending The Dog Whisperer books and DVDs; they really changed my life and Sam's too, for the better." 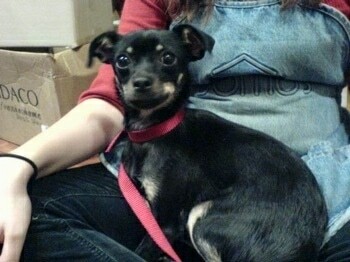 "This is a picture of Lou, a Chihuahua / Miniature Pinscher mix at 7 months old. Lou is very sweet and great with children. He is also very hyper and likes to chew on everything. He could run all day if you let him. He only stops running and playing to eat. He seems to be very balanced for a Chihuahua mix; he has none of the small dog dominance issues. We have been watching the Dog Whisperer and have read his book; it has worked well with all of our dogs." "This is our Chipin Sophie. My boyfriend and I rescued her from the pound a couple of months ago, and we think she is about 1 year and 4 months old. She is an awesome dog! 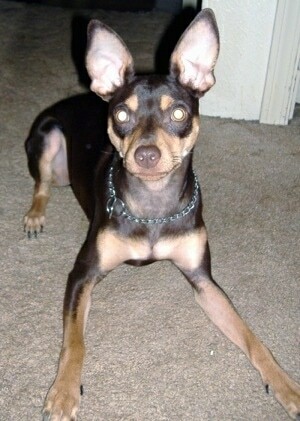 She has the coloring and lean body of the Min Pin (she is only 9 lbs. ), and the face of a Chihuahua. At first she was scared of everything, even stairs, but she got over her fears quickly. We think it was because she was a stray and had been moved around so often in such a short period of time. Now she is a little fireball and thinks everyone on the planet is here just to love on her. She is great with other dogs and with kids, although she can be a little shy at first. Sophie loves, loves, loves her walks and likes to burrow (especially into fresh warm laundry). We live in a small apartment and she seems to be fine in here as long as we exercise her regularly. She has been easy to train (she knows sit, down, stay, come, rollover, bow, stand, speak, and shake... all in a month!) although she can be a bit stubborn and she has "accidents" every once in a while. She also likes to eat things around the apartment while we are not home, including water bottles, potpourri and clothing. Even so, we love her to death! She is the sweetest thing around and we were so happy to be able to finally give her a loving permanent home where we can spoil her for the rest of her life. "Sophie and I are both huge fans of the Dog Whisperer! Although we don't own any of his books, we watch the show at least twice a week. 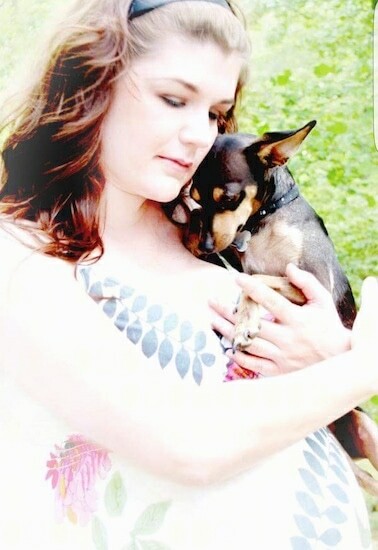 I watched the show even before we got a dog, so from the beginning my boyfriend and I have been sure to be pack leaders first and friends second even though we were so excited to take her home. We learned to tell when a dog is trying to assert leadership and how to correct it into submissive behavior. We put up boundaries that include no sleeping on the bed, she has to sit and wait patiently before being fed, no growling, no pulling on walks, no jumping, and for us to stay calm and assertive even when we are angry and want to yell. Cesar's techniques have been great for us! I've noticed that Sophie responds much better to a stern, calm "no" or "off" rather than in an angry voice. I also think she respects us for having rules and it is much easier for us to control her around the home and especially when we have guests over. Cesar also taught us that walks aren't just for fun...dogs really need them. It is easy to tell the days Sophie has gotten long walks because she doesn't pounce on our faces anymore. This has especially been a useful bit of information! I believe that if we are consistent Sophie will continue to become more and more balanced." 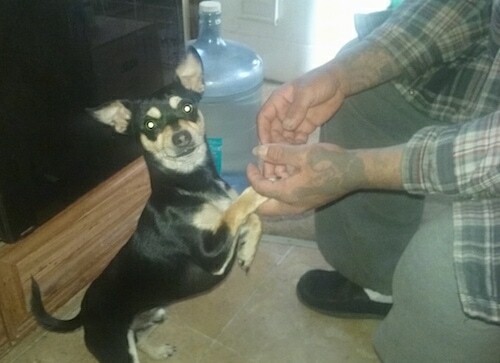 Chipin brothers Mello and BB at 2 years of age (Chihuahua / Min Pin hybrids)— "The Chipins are from the same litter. The tan one's name is Mello. The mostly black/multicolored one's name is BB. BB is the alpha male, which is surprising because Mello is more protective. BB's favorite toy is a wool knot with a squeaker and Mello's is a tennis ball. They both love rawhides; in fact, they fight frequently over one hide even when two are available. They are my loves!" 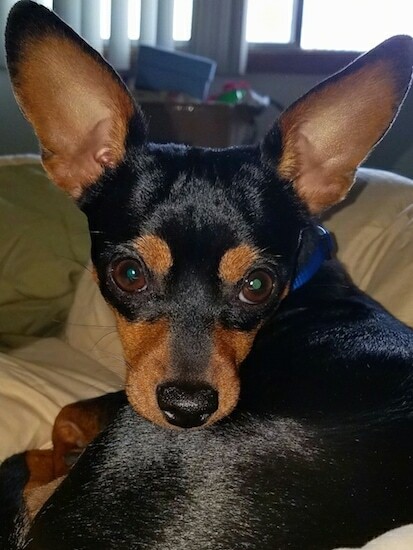 Snoop the Chipin (Min Pin / Chihuahua hybrid) at 9 months old—"He is extremely playful and protective. He doesn't put up with anything from bigger dogs and he loves to play and always wants to cuddle. Great dog!" 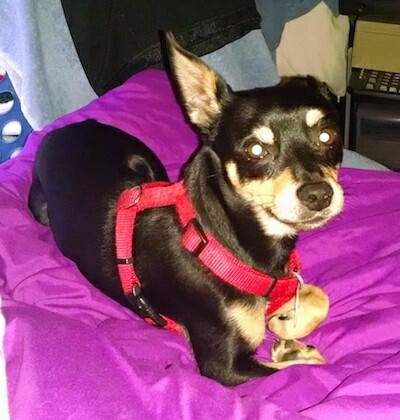 Saki the Chipin (Min Pin / Chihuahua mx breed dog) at 5 years old—"She is a dog that I got two years ago as a birthday gift from my ex-husband. She is very sweet and very smart! 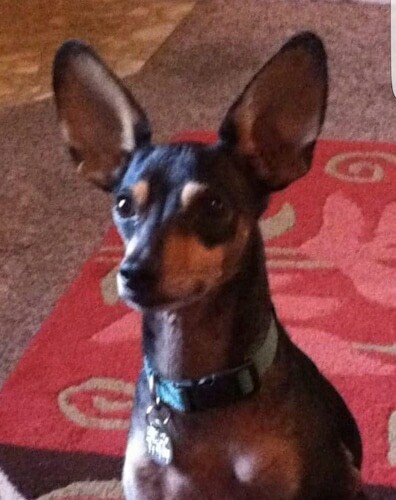 Now to work on her social skills with bigger dogs :)"
Zoey the Chihuahua / Min Pin hybrid (Chipin)—"In this pic she was 9 months old, 18" long, 12" at the shoulders and weighed 8 pounds." Minnie the Chipin puppy (Chihuahua Min Pin mix) at 6 months old—her owner says, "She is the sweetest, most playful dog." 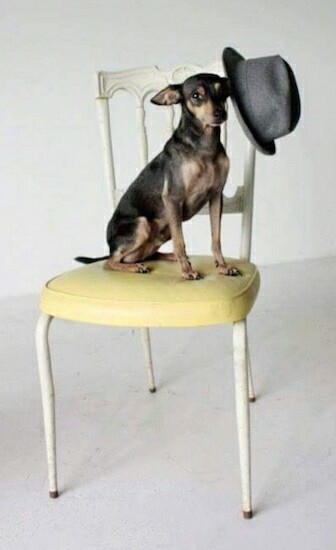 Bruno the Chipin (nicknamed Cheekie) at about 2 years old, weighing 16 pounds—He is 50% Chihuahua and 50% Min Pin." 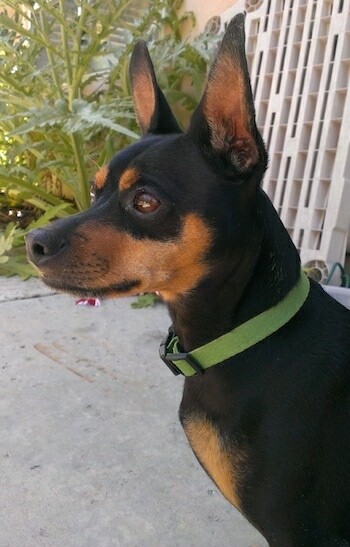 Bruno the Chipin (nicknamed Cheekie) at about 2 years old, weighing 16 pounds—"He is 50% Chihuahua and 50% Min Pin." Shoeless Joe "Jackson" or "Jack" the Chipin—"Jackson has been a part of my family since he was about two months old. He is now 11 years old and still one of my babies. My 8 year old daughter is my other. 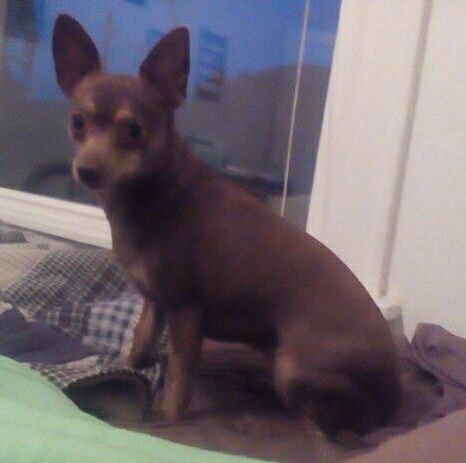 His mother is a pure bred Chihuahua and is father is half Chihuahua and half Min Pin. 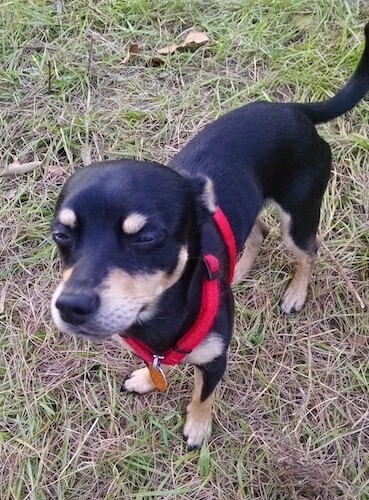 So he's 3/4 Chihuahua and 1/4 Min Pin. Jack is extremely sweet, smart, well tempered, and almost never barks. He enjoys sleeping under the covers, taking joy rides and laying around with the cats. I don't know how he has learned but he doesn't get in or out of my car unless I tell him to and he stays within 6 inches of me when we go somewhere. He never runs off, even when another animal is present or food. He will whine, look at me and then the item, to "ask" permission to go investigate. He really has been an amazing dog. It took two years before he became this well-behaved, but somehow, he did."